CanHepC is designed to facilitate the establishment and development of inter-institutional, inter-disciplinary, cross-jurisdictional research initiatives. The network is structured around four research cores in addition to two transversal cores dedicated to training and knowledge translation and implementation. Impact of treatment on reversing liver disease progression and other pathologies. The Knowledge Translation (KT) core is built on the principles of integrated KT, to take advantage of the various partnerships enabled by the Network. The objectives of our research must be informed by the current realities facing HCV patients and healthcare systems and must achieve outcomes that will impact them. Each stage in the research process will be used as an opportunity to create and foster collaboration with knowledge users (KUs). Community-based organizations, very active with vulnerable populations, will enable feasible integration of new knowledge into practice and different communities. Decision makers will help the network to achieve broadly applicable and sustainable health services interventions and population health strategies. We aim to leverage the ability of patient organizations to reach out to patients to facilitate patient-mediated KT strategies. Patients and communities – enhance the use of systematic comprehensive screening programs in vulnerable populations, improve awareness and knowledge about testing and treatment options – collaboration with the Canadian Liver Foundation (CLF), CATIE –Canada’s Source for HIV and Hepatitis C information, other organizations and patient partners. CanHepC is dedicated to provide transdisciplinary training and mentorship to accelerate the development of critically needed capacity in HCV research. 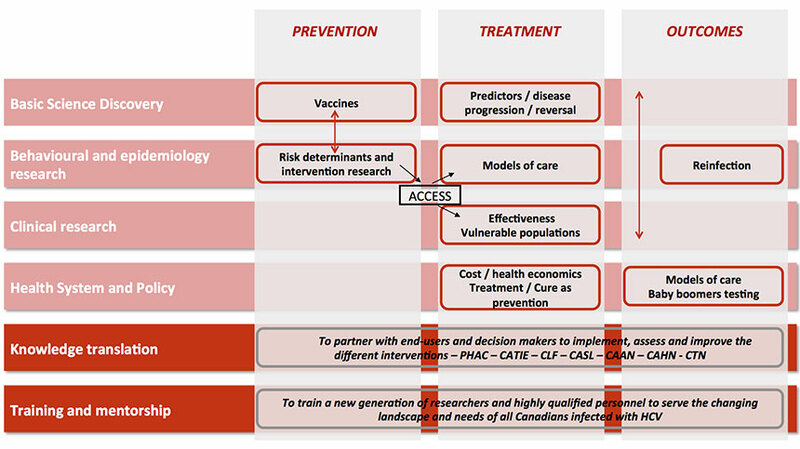 CanHepC is building on the achievements of the National CIHR Research training program in Hepatitis C (NCRTP-HepC), established in 2003, to train the next generation of researchers in all areas related to HCV in Canada using a multidisciplinary approach. Since 2003, a total of 71 trainees and 46 summer students have benefited from the program and their success is recognized worldwide. Some of them became leaders in the field and have now come full circle as independent investigators and co-applicants of this network. The existing NCRTP-HepC curriculum and trainees is now completely integrated into and remain a central focus of the CanHepC. Click here to learn more about the CanHepC training program.